In case you forgot to tune in to our newsletter last month, this June is a special month for us here at Amish Originals. It’s our birthday! 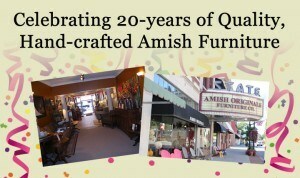 Amish Originals is pleased to announce the celebration of our 20th anniversary. The staff at Amish Originals would like to express our heartfelt gratitude to our customers and friends for 20 years of loyal support. Oh yeah almost forgot to mention, we’re moving! As announced last month, plans are currently being drawn for a remodel of our 38 N. State Street location. Upon completion, we will consolidate our entire operation under one roof for the first time in 20 years! As part of the process, we have been gathering discontinued, one of a kind, and long forgotten accessory items. These original pieces have been marked down 30-70%! Hurry and stop in soon to see what treasures you might find as quantities are limited.